The winner in the Energy, Efficiency and Sustainability category is a ground-breaking project that promises to be a world first and could help pave the way to a greener future in the UK and beyond. Swansea Bay Tidal Lagoon will use a 9.5km breakwater wall to harness the power of the tides, with which the west coast of the UK is particularly well endowed. The 4-5m height difference in water between high and low tides will be used to drive 16 hydro turbines, providing clean, reliable electricity for more than 120 years. Project partners Tidal Lagoon Power (TLP), Atkins and LDA Design have worked together to develop new technologies to maximise energy efficiency and value for money. Prior to working with TLP, Atkins had collaborated on a research project for the concept design of a novel low-head tidal turbine specifically designed to work on both ebb and flood flows. Whereas existing tidal-power schemes such as La Rance Barrage in France and the Sihwa barrage in South Korea utilise around 20 per cent of the available potential tidal energy, Swansea is expected to achieve efficiency in excess of 50 per cent. the banks of the breakwall. With an installed capacity of 320MW, the lagoon will provide 530GWh of net power output annually, enough to provide clean energy for over 155,000 homes. According to the developers, the project will result in 236,000 tonnes of carbon savings during each year of operation. “The collaboration with Tidal Lagoon Power, LDA Design and others has resulted in a truly innovative project. Swansea Bay Tidal Lagoon will be the first project of its kind in the world,” said Atkins practice director Richard Schunter. Construction of the facility is predicted to directly sustain over 2,200 jobs, and two new manufacturing sites are set to be located in Wales for the build. One of these will focus on machining and pre-assembly of turbines, while the second will deal with heavy fabrication of steel components. It’s estimated that 100,000 tonnes of steel will be used during construction, the bulk of which will come from the UK. 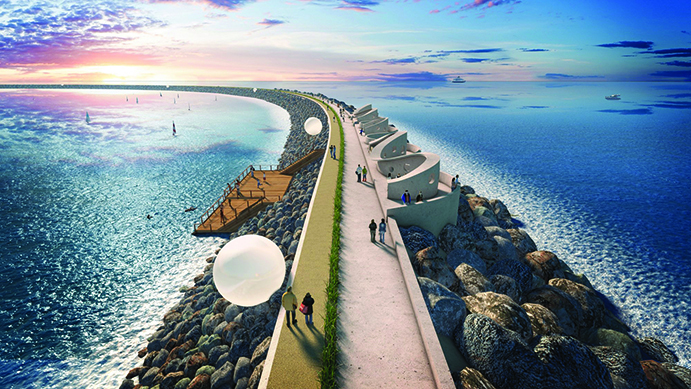 Central to the overall design of the lagoon is the breakwater, which Atkins worked on as part of an integrated and collaborative technical team. One of the fundamental challenges was to produce a commercially workable design that was sufficiently watertight. Innovation came in the form of a sand core rather than the rockfill used in traditional breakwater construction. However, the consistency of the sand is crucial: too fine and it gets washed out by the difference in water pressure; too coarse and the flow of water would reduce the head difference, leading to the loss of available power. As luck would have it, a site investigation of the bay revealed that suitable sand deposits were available and could be dredged from within the circumference of the lagoon itself to create the breakwater’s core. Compared to using imported rockfill, local material reduces the capital cost, as well as providing the lower permeability that will enhance the overall efficiency of the lagoon. As well as enabling the power of the tides to be harnessed, the lagoon is intended to be used as a community amenity. The seawall itself will be open to the public for exercise and will feature open space that includes a beach and rock pools. Meanwhile, the lagoon will be available for leisure activities and watersports such as rowing, sailing and canoeing. According to TLP, there are already preliminary plans to stage a triathlon event in and around the lagoon, and 100,000 tourists are projected to visit the site each year. “What’s brilliant about this project is that it’s not only about sustainable, next-generation energy, which is of course vital. It’s also about creating a lasting legacy for Swansea and Wales,” said Alister Kratt, board director at LDA Design. Conservation is also a key pillar of the proposal. There are plans for new salt marshes, as well as a lobster and oyster hatchery that will support the reintroduction of the region’s native oyster. The developers claim that the project will also protect against coastal erosion and flooding, and the design has been carried out to make allowances for future changes in sea levels. Perhaps most importantly, Swansea Bay Tidal Lagoon can be a pathfinder project to demonstrate that the technology is ready for widespread adoption. If successful, it will provide a scalable blueprint that can be applied at various other sites across the UK, and at sites around the world where suitable tidal ranges exist. Larger lagoons would not only benefit from economies of scale; they would also have the potential to generate exponentially more power. Just up the road in Cardiff, for example, plans are already under way for a lagoon with a breakwall roughly twice the length of the one that will be built in Swansea. However, the Cardiff lagoon would produce around 10 times the amount of electricity. Other lagoons are planned in the Severn Estuary, North Wales and Cumbria, and in total could amount to 8 per cent of the UK’s electricity needs. What’s more, the dispersion of the sites provides a geographical solution to the natural intermittency of tidal ebb and flow. Further afield, opportunities for the technology have been identified in France, Mexico, Canada and India, and academic studies have identified over 300GW of potential tidal range capacity globally. It’s a project with the capacity to have a major impact on energy provision around the globe for decades to come. Virtually every food-processing site in the UK uses automated clean-in-place (CIP) technology, where cleaning fluids are circulated around plant equipment such as vats and pumps. However, existing systems are unable to detect when the cleaning process is complete, leading to wastage of water and chemicals, as well as excessive operational downtime. Martec of Whitwell, in collaboration with the universities of Nottingham and Loughborough, has developed an autonomous system that incorporates sensors and AI to streamline the task. Self-Optimising Clean-in-Place (SOCIP) can detect the level of fouling on equipment using optical and ultrasound sensors, delivering data in real time. Meanwhile, AI enables predictions to be made on remaining cleaning time, with the potential to improve production scheduling. It’s estimated the technology could create savings of around 30-40 per cent depending on the application. Having initially gained research funding from Innovate UK, additional partners joined the collaboration in the shape of sensor specialist Synatel and food manufacturer Greencore. According to Martec, the project’s success has been fuelled by all parties introducing one another to their respective worlds of specialist knowledge, explaining and justifying current practice in a process of two-way dialogue. The team is currently in talks with a number of major retailers and manufacturers about the commercial adoption of the technology. Based in Scotland, the ASLEE project is exploring the technical and economic feasibility of using algal bioproduction as a transactive energy load. While the region has some of the best renewable energy potential in Europe, local capacity issues in the National Grid are a barrier to commercial development and adoption. The multi-disciplinary collaboration is aiming to use intermittent renewable energy as the basis for a new bio-manufacturing industry based around microalgae. The single-celled plants have simple growth requirements, needing just light, water, CO2 and some nutrients to flourish. As part of the project the team, led by Xanthella, designed and manufactured a new photobioreactor (PBR) to conduct the research. The Pandora 1000 L contains a number of submersible and bespoke LED light sheets, which can be ‘over-driven’ during times of excessive load with no adverse effects on the algae. Modular arrays of the Pandora PBRs can be scaled up to meet local requirements, acting as a grid frequency balancing tool. The collaborating partners believe the project, which is still at the industrial research phase, has the potential to create a new industry for Scotland’s rural areas while also providing jobs in regions that are economically fragile. No mention of the strike price for the electricity needed to make the economics work. Last time I saw this quoted it was even highre than that needed for the Hinckley Point Nuclear power station (which is already well above the current wholesale electricity price). Hopefully the cost of transportation of the steel needed for the project can be minimised by buying it from just down the road – Port Talbot steelworks is on Swansea Bay. An innovative project. But how much carbon will be used to construct a 9.5km wall with suffiicent height to withstan the predicted sea level rises and storm surges? I’m with Nick on this one, whilst reading the article the first thing that sprang to mind was the carbon footprint of this build?!! I hope that the governmental policy of not subsidising so-called renewable energy prevents this project from adding to the UKs list of “unreliables” (i.e. power stations that can only give powers when nature allows not when man needs it). It is totally foolhardy to think that such a scheme can provide economic electricity: the UK needs economically competitive power to prosper: most of our competitors have far lower power prices than the UK – who can sell in the world market with both hands tied? I have worked on two tidal power projects. One was in north-western Australia where the site conditions were ideal and a tidal range was 8.5 m. We were competing with diesel generation and also had government subsidies. We couldn’t get within a bull’s roar of being economic. A major problem was that the neap tides were 2.5 m – a problem common to all tidal power schemes. So how on earth do they get 50% capacity factor out of Swansea Bay – especially as they are using bidirectional turbines that, according to my book on tidal power produce less energy than single direction. La Rance has bidirectional turbines that only operate in one direction. The other project was the Kalpasar project in India. It was something like 5000 MW and similar to Swansea Bay. It too, was hopelessly uneconomic. There is a 250 MW tidal power scheme in Korea that is probably close to economic. But it didn’t have to pay anything for the civil works – the barrage had already been built to store freshwater – which promptly went foul. So they had to abandon freshwater storage and found another use for the civil works. But there is one criteria that it must beat – is the tidal power project plus all the backup it needs cheaper than nuclear power? I very much doubt it. The potential for massive cost reductions in nuclear power as new reactors get into serial productions and if the regulators finally realise that low levels of nuclear radiation are harmless, is enormous. The potential for cost overruns on the tidal power scheme is enormous. Good idea as long as the technology is unlikely to be bettered in the near term. Also rise and fall of the water acting on floats could be used to generate even more energy (size of floats to be gauged on any water not passing through turbines). How is this the first of it’s kind in the world; has no one heard of the Rance river barrage as mentioned in the text in northern France. It has been producing power since the 1960’s. It has one of the highest rise & fall tides on the planet! The problem with the Severn estuary is it is too wide. Too much silt would collect and block it up eventually. What they need is a series of turbines all along the river at every weir, also along every weir in every river in the country. This would be low cost & deliver power to the local area. It would be much quicker to construct as well with little impact to the environment. The FT on Sunday reported UK government has decided the project is not good value for money and will not create many jobs. Looks like a bit of problem between government departments on this. Another example of industrial strength ineptitude and incompetence.